In a conventional Statistical Process Control (SPC) loop, operatives remove parts from the production process at cyclical intervals and check them, for example, for dimensional accuracy. In the event of deviations, an employee has to intervene in the machine and control sequence in order to correct the settings. This is often only possible with a considerable delay, during which reject parts are produced. The ARBURG host computer system (ALS) is a modular production planning and monitoring tool, which monitors and documents the production process online. 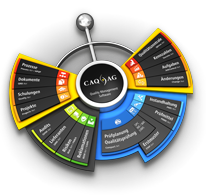 The system is now also available with an appropriate connection to the external quality assurance module of CAQ AG, which is able to read in the ALS data for batch evaluation. In its basic stage, ALS can be used in conjunction with an optional QS module for statistical process control. ALS thus offers the option of checking the process parameters at cyclical intervals. This permits the most important process parameters, and thereby the results of the process, to be monitored. Systematic process fluctuations and parameter or process changes caused by external factors can thus be included in the monitoring. If control tolerance limits are exceeded, the responsible employee is informed either via a QS traffic light or a screen in the production hall and can respond immediately. One important advantage of the system is that the item and machine-related testing plans created are always automatically activated when the particular item is produced again. This means that when the machine has been set up and production started, process monitoring also beings automatically. The decision on which articles this function is used for is taken by the customers themselves based on their documentation obligations. In a second expansion stage, ALS is able to store the process parameters and test plans selected for the article together with the order data in an archive after the job order has been completed. This allows job orders to be deleted in the productive system. The archived values are not lost, however, as ALS continues to store them according to the order dates. This is important, e.g., for future certificates of capability, in order to retrospectively document trouble-free processing of a job order. In the third expansion stage, selected parameters can be transmitted to the CAQ system from CAQ AG via an interface module. With CAQ.Net®, ARBURG’s cooperation partner offers a system for computer-aided quality assurance, which is equally as modular and expandable as ALS itself. It provides effective and efficient quality management with targeted, matched segments for a customised CAQ solution. Compatibility, and therefore high performance and future-proofness, are fully ensured in conjunction with the ARBURG host computer. In the fourth and final expansion stage of ALS, all target value changes can also be documented automatically with the aid of a setup log. This applies to all parameter changes made to the control system during a defined job order period. This feature is particularly important for GMP-oriented production processes, which are common for medical technology. Furthermore, all the recorded production run data can also be archived via the production log in ALS. This enables separate documentation of 100 percent monitoring.